Celebrate summer with this refreshing strawberry frozen coconut yogurt with succulent and sweet strawberries & a little lime juice for a perfect balance of slightly tart and sweet. It’s crazy delicious and I am pretty sure once you have tried it that you are hooked and cannot think of something else for at least a while. I’ve have talked about my craze for coconut milk yoghurt before and my Coconut Berry Smoothie is still one of my favorites. I can’t really pin-point why I love coconut yoghurt so much. I love the flavour of coconut but coconut milk yoghurt goes beyond anything I have ever tasted before. It comes really close to my version of bliss: it’s sweet, tangy and very refreshing. For some reason it reminds me of ice wine. I know it doesn’t make any sense as ice wine is made from frozen grapes and coconuts are tropical fruits that thrive on sunshine. But ice wine and coconut yoghurt are much alike in their distinctive acidity, fruitiness, sweetness and freshness. The first time I tried coconut milk yoghurt, I couldn’t help but think I wanted to turn it into ice-cream. So on this beautiful sunny day is set out on a mission to do just that. 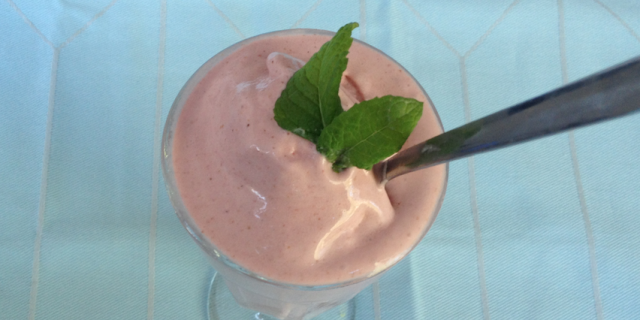 I decided to make a soft-serve frozen strawberry coconut yoghurt. The result? It’s just too good to be true. My bowl was finished before I knew it and I will admit that I even ended up licking my bowl clean (but let’s keep that between you and me). Add to a bowl with the coconut palm sugar and lime juice. Allow the sugar to dissolve. Cover the bowl with a plate and let sit for 2 hours at room temperature. Transfer the strawberries and the sugar syrup to a high-speed blender. Add the coconut milk yogurt. Pulse until smooth. Add the mixture to your ice-cream maker and follow the manufacturer’s instructions. If you freeze it for an hour before adding it to the ice-cream maker, it will be better but I added it right away and it came out just fine. I use Le Magimix Le Glacier and it takes me about 15 minutes to get the consistency I like. If you don’t have an ice-cream maker, add to the mixture to a container and cool in the freezer for 1-2 hours until solid. Use right away for best results. To serve, scoop into a bowl. Feel free to add some fresh strawberries or fresh mint leaves.